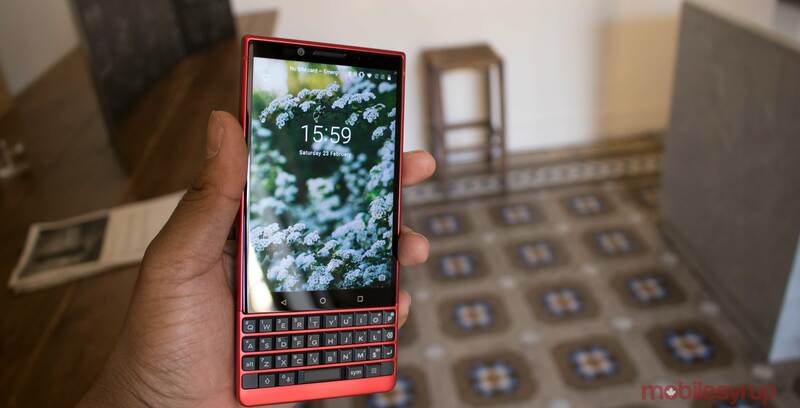 At Mobile World Congress in Barcelona, Spain, TCL announced the BlackBerry KEY2 Red Edition, a new, colourful version of the keyboard-clad smartphone. The phone appears to be nearly identical to the standard KEY2, which means it features a physical keyboard and BlackBerry’s security and privacy features. The Red Edition, which TCL describes as “deep red,” features a Series 7 aluminum frame and black accents covering the textured rear of the phone. “We always appreciate the opportunity to respond to our customers when they ask for an exclusive device variant — which is why we offered the BlackBerry KEYone Black Edition — and now we can respond again with the BlackBerry KEY2 Red Edition which offers a fresh take on our award-winning BlackBerry KEY2 smartphone,” said Francois Mahieu, global managing director for BlackBerry at TCL Communication, in a statement sent to MobileSyrup. The phone also features 6GB of RAM and 128GB of storage, just like the standard version of the KEY2, along with Google Assistant being built directly into the smartphone’s convenience key. The BlackBerry KEY2 Red Edition will be available in select markets across North America, Europe, Middle East and Asia starting at £699/$749/€779 (roughly $983 CAD). Back when the KEYone first dropped back in 2017, BlackBerry released a special ‘Black Edition’ of the smartphone. Regarding specific Canadian availability and pricing, TCL says that is has nothing to announce at this time.